TMS stands for transcranial magnetic stimulation. It is used to treat depression by stimulating the brain non-invasively using an electromagnetic field, similar to those magnetic fields produced by an MRI machine. During TMS Therapy, a magnetic field is administered in very short pulses to the part of your brain that research has demonstrated to be associated with depression. The typical initial outpatient course of treatment is about 30-60 minutes daily over 4-6 weeks. TMS is non-invasive; it does not involve surgery, insertion of intravenous lines or anything else put into your body. It also does not require any anesthesia or sedation. TMS uses a small electromagnetic coil controlled by a computer program to deliver short, powerful bursts of magnetic energy focused precisely on the left side of the brain’s frontal cortex. The TMS magnetic fields are the same type and strength as those produced by a magnetic resonance imaging (MRI) machine. A treatment coil is applied to the head above the targeted area of the brain, called the prefrontal cortex. This part of the brain is involved with mood regulation. TMS magnetic fields do not directly affect the whole brain; they only reach about 2-3 centimeters into the brain directly beneath the treatment coil. As TMS magnetic fields move into the brain, they produce very small electrical currents. The electrical currents activate cells within the brain, which are thought to release neurotransmitters. TMS is being used to reduce anxiety, hallucinations, and symptoms of PTSD by reducing brain activity in certain areas. Is TMS a good alternatives for patients who cannot tolerate the side effects associated with antidepressants? TMS therapy is non-systemic (does not circulate in the blood throughout the body), so it does not have side effects such as weight gain, sexual dysfunction, nausea, dry mouth, sedation, among others that are commonly found with antidepressant drugs. The most common side effects reported with TMS during clinical trials were headache and scalp pain or discomfort – generally mild to moderate – occurring less frequently after the first week of treatment. Pregnancy: Many women choose to avoid antidepressant medications during pregnancy, but depression itself has been shown to cause complications. Based on a number of studies, TMS appears to be a promising treatment option for pregnant women who do not wish to take antidepressant medications. Is TMS like other alternative therapies who use magnets to treat some other disorders? No. 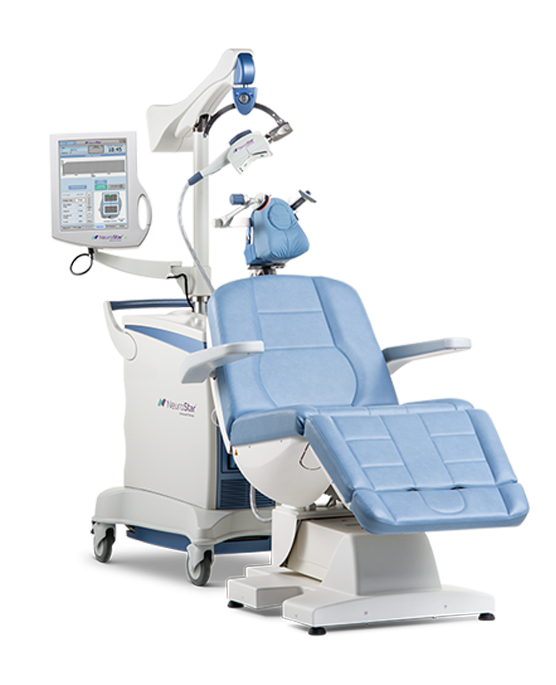 TMS therapy involves a unique method cleared by FDA using pulsed magnetic fields for therapeutic benefit. The intensity of the magnetic field is similar to that of the magnetic fields used in magnetic resonance imaging, or MRI. These techniques differ radically from the use of low intensity, static magnetic fields. These products deliver weak and undirected static fields that are not capable of activating brain cells. No, the two procedures are very different. While both are effective in the treatment of depression, there are many differences in safety and tolerability. Electroconvulsive Therapy (ECT) and Transcranial Magnetic Stimulation (TMS) are both cranial therapies used in the treatment of mental illness or mood disorders. ECT uses an electric current and is usually administered in a hospital setting and associated with various side effects, some of which may be serious such as memory loss. TMS, by contrast, is a non-invasive therapy and is generally administered in a doctor’s office or out-patient setting and commonly has no side effects. During the TMS Therapy procedure, patients sit in a chair and are awake and alert throughout the entire procedure – no sedation is used with TMS therapy. Unlike ECT, patients can transport themselves to and from treatment when receiving TMS. In over 10,000 active treatments with TMS therapy in clinical trials, no seizures were observed. However, post-marketing surveillance has shown there may be a remote risk of seizure with TMS therapy. Current evidence places the risk of seizure with TMS at 1 in 30,000 treatments. TMS therapy has consistently been shown to have no negative effects on memory function in clinical studies. In contrast, electroconvulsive therapy (ECT), intentionally causes a seizure. Patients receiving ECT must be sedated with general anesthesia and paralyzed with muscle relaxants. Recovery from an ECT treatment session may be rapid over several minutes, or take a few hours. Patients are not allowed to drive immediately after having ECT. Short-term confusion and memory loss are common with ECT, and long-term disruptions in memory have been shown to occur in some people. Because of the side effects associated with ECT, a significant amount of caregiver support may be required. What is typical course of treatment with TMS? In clinical trials, patients received TMS 5 times per week for 25 minute sessions, over 4-6 weeks. Patients treated with TMS should receive treatment for four to six weeks with additional treatments based on clinical judgment. Length of treatment varies from person to person based on factors such as motor threshold and treatment protocol. What are the potential risk with TMS Therapy ? TMS therapy is well tolerated and has been proven to be safe in clinical trials. Throughout over 10,000 active treatments performed in clinical trials, the most commonly reported side effect related to treatment were scalp pain or discomfort during treatment sessions. These side effects were generally mild to moderate, and occurred less frequently after the first week of treatment. Less than 5% of patients treated with TMS therapy discontinued treatment due to side effects. No evidence suggests these effects are permanent if earplugs are worn during the treatment. TMS has not been associated with many of the side-effects caused by antidepressant medications, such as gastrointestinal upset, dry mouth, sexual dysfunction, weight gain, or sedation. In clinical trials, over 10,000 TMS treatments demonstrated its safety, with no occurrence of seizures. However, there is a small risk of a seizure occurring during treatment. Current evidence places the risk of seizure with TMS at 1 in 30,000 treatments. While TMS therapy has been proven effective, not all patients will benefit from it. Patients should be carefully monitored for worsening symptoms, signs or symptoms of suicidal behavior, and/or unusual behavior. Families and caregivers should also be aware of the need to observe patients and notify their treatment provider if symptoms worsen. Who shouldn't receive TMS Treatment ? Failure to follow this rule could cause the object to heat up, move, or malfunction, and result in serious injury or death. No, TMS therapy uses the same type and strength of magnetic fields as MRIs (magnetic resonance imaging), which have been used in tens of millions of patients around the world and have not been shown to cause tumors. The magnetic energy used in a full course of TMS therapy is a small fraction of just one brain scan with an MRI. No, TMS therapy was systematically evaluated for its effects on memory. Clinical trials demonstrated that TMS therapy does not result in any negative effects on memory or concentration. TMS improves memory. According to a study published in the Aug. 29 issue of the journal Science, “electrically stimulating a portion of the brain that coordinates the way the mind works can enhance memory and improve learning.” The researchers used Transcranial Magnetic Stimulation (TMS) to indirectly stimulate activity in the hippocampus, a key part of the brain involved in the storage. Is TMS used for other neuropsychiatric disorders besides Depression ? ​Currently, TMS is used primarily for the treatment of Major Depressive Disorder, which is the only indication approved by the FDA. However, since TMS can be used to stimulate different regions of the brain in different ways, it is also used as a treatment for Bipolar Depression, Anxiety, Obsessive Compulsive Disorder, PTSD, Auditory Hallucination associated with Schizophrenia, Negative symptoms associated with Schizophrenia, Migraine Headache and Fibromyalgia. As you can see this is a very exciting and evolving technology. Are there side effects of TMS treatment? There are a couple of minor side effects reported with TMS. They are mild to moderate scalp irritation and mild headaches, that affect nearly one half of all patients. These issues usually go away after the first week of treatment. These symptoms may be treated with over-the-counter analgesics. If symptoms persist, the TMS physician or technician can reduce the strength of the magnetic field pulses to make the patient more comfortable. Note: Less than 5 percent of patients treated with TMS Therapy discontinued treatment due to side effects. How long does the effect of the TMS last, Will I need TMS sessions beyond the first 4-6 weeks? In most patients, the clinical benefit of TMS therapy was maintained through 6 months of follow-up study. Talk to your doctor about your long-term treatment path. Can I also take antidepressant if I am receiving TMS treatment? Yes. In clinical trials, TMS therapy was safely administered with and without other antidepressant medications. What does FDA approval means? The NeuroStar TMS Therapy system was the first TMS device to be approved by the U.S. Food and Drug Administration (FDA) for the treatment of Major Depression Disorder, FDA approval was based on a large, multicenter, placebo-controlled trial for the treatment of Depression (O’Reardon. Biol Psychiatry, 2007). TMS devices are currently in use worldwide, targeting a number of psychiatric and non-psychiatric disorders. Off label application of TMS treatment? The term “off-label” refers to the absence of FDA clearance or approval for a device or medication. Pharmaceutical companies and device manufacturers are not allowed to promote a product for any other purpose then what was studied in the FDA trials. However, once a drug or device has been approved for one purpose, physicians are free to prescribe it for any other purpose that in their professional judgment is both safe and effective, and are not limited to official, FDA-approved indications. Many old good medications are used “off-label” to treat many psychiatric and non psychiatric disorders. There is growing research and clinical application regarding use of TMS targeting additional psychiatric and non-psychiatric disorders. TMS Therapeutics is on the cutting edge of new research in developing protocols to discover new applications in addition to expanding on currently known uses. Will TMS be covered by my insurance and/or Medicare/Medicaid? TMS Therapy for depression is covered by many insurance companies like Blue Cross Blue Shield, Humana, Medicare, United Healthcare, Aetna, Cigna, Medicare and Medicaid. If your insurance provider is not presently covering TMS and you would like assistance in securing coverage, Care First TMS Center can work as a patient advocate, on your behalf, to determine benefits and help you negotiate with your insurance provider for reimbursement, on a case-by-case basis. Our practice manger will be able to assist in determining insurance coverage, and request prior or retro-authorization. More and more patients are able to get at least partial reimbursement from their insurance company. Other funding options include cash basis, withdrawal from a healthcare flexible spending account, or financing. Many providers and patient advocacy groups are actively working to ensure TMS therapy is available under more commercial insurance companies and Medicare. How long has TMS been been used as a treatment for Depression ? TMS was invented in 1985. It was originally used for research, but has been used to treat depression since the late 1990s. In 2008, the FDA approved the first TMS device, known as the NeuroStar® TMS Therapy System, which is designed especially for the clinical treatment of depression. How quickly does TMS treatment works? Depression is a syndrome that can have many different symptoms and not every person with depression has the same symptoms. Therefore responses to TMS vary from person to person. However, many people report thinking more clearly and improvements in sleep pattern, energy level, and appetite during the first week or two of treatment. Many times these symptoms improve before a person’s mood. How effective TMS is as a treatment for Depression? Clinical studies have shown that TMS is effective about 75% of the time, which means that it is twice as effective as antidepressant medications and almost as effective as electroconvulsive therapy (ECT). Half of those who respond to TMS experience significant improvement in the first four weeks of treatment. Is TMS a cure for depression? Everyone’s depression is different, however 90% of patients who respond to TMS continue to do well a year after treatment. Some people may require periodic or “maintenance” TMS, which often consists of just one or two treatments every few weeks or months. Some people also begin to do well on medications, even if medications did not previously help before receiving TMS treatment. In the event that your insurance plan does not have an established coverage policy for TMS therapy, out of pocket expenses may be necessary to receive treatment while we work to secure insurance coverage. Since the cost of treatment can vary based on a number of factors, including the total number of treatments, it is our policy not to quote specific costs. Please contact our office to inquire further about cost and financing. Is there a consultation fees? Since the initial consultation is a comprehensive consultation with a complete mental health assessment, complex medical decision making, communication with your other treatment providers and a detailed introduction to TMS therapy, how it works, and how it may or may not benefit you, there is usually a fee for the initial consultation. Most of this cost should be reimbursed by your insurance plan. TMS therapy may not be the right treatment for you. As a specialist in Treatment Resistant Depression, Our Psychiatrist can discuss other treatments options which may be more appropriate. Whenever this is the case, we will tell you and provide additional referrals as needed. The first step in the TMS treatment process is determining whether or not TMS is an appropriate treatment for you. This is done in a consultation with our psychiatrist, who will review your symptoms, treatment history, and possible treatment options. When you contact Care First TMS Center Inc., our staff will schedule this evaluation, which will last about an hour and is covered by most insurances. Your first session and during the procedure? If TMS is right for you, an initial treatment session will be scheduled. At this first visit, which may last over an hour, your Psychiatrist will determine the appropriate placement and energy settings of the treatment coil. Placement of the treatment coil and the strength of the magnetic field are important factors in successful TMS treatment. In order to do this, a test is done to determine what is called the motor threshold. A magnetic pulse will be repeatedly given to find the strength that is just enough to result in a movement of your right thumb. From there, the coil is moved forward to a specific area over the left frontal lobe, and a treatment is delivered. The actual treatment session lasts about 25 minutes. 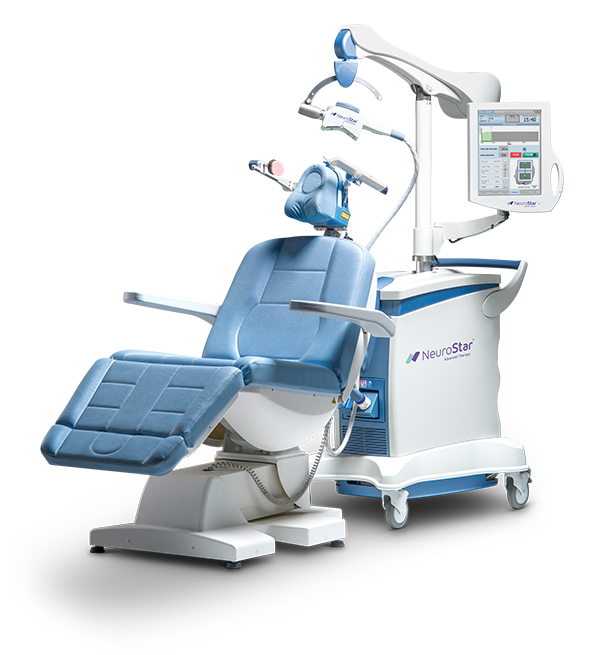 As you sit reclined, awake and alert, the TMS System delivers 40 rapid MRI strength magnetic pulses over 4 seconds. The pulses make a loud clicking sound. The pulses feel like a tapping on the scalp but without the sensation of anything touching the skin. The same 4 second sequence is repeated 75 times, approximately every thirty seconds. During the session you can watch television, listen to music, or simply sit back and relax. Treatment sessions are then repeated each day using the settings initially determined by your Psychiatrist. A usual course of treatment involves sessions 5 days a week for 4 to 6 weeks, although this can vary depending on a patient’s response to treatment. A tapering set of treatments is sometimes used to ensure your improvement. As you progress through your therapy, your Psychiatrist, and the TMS staff will regularly assess your progress and determine the eventual number of treatments.